This DATS session will introduce archival data repositories researchers might be interested in using to discover datasets or depositing their own data and code for long-term archiving for others to discover. We will cover Dataverse, Dash/Dryad, and Zenodo. …So it’s a place to put your data and analysis scripts that will be accessible beyond the life of a research project, grant, or individual career. Is the repository endorsed by a funding agency, scholarly journal, professional society, library, etc? Is it listed in the Registry of Research Data Repositories? Is there evidence that the repository will be around in Five years? Ten years? Is the owner/manager of the content reliable? One of the primary reasons to deposit your data in a repository is to obtain a unique identifier that others can use to cite your data. This service will increase the visibility of your data within the scholarly literature and allows researchers to find it later on. Ensure your data repository offers a DOI (digital object identifier), handle, or another unique identifer. The usability of a data repository is also important in ensuring that others will be able to access your data. If your peers are unable to find and download your data it will limit the effectiveness of sharing your data. A usable data repository should allow for users to easily upload, download, and cite data sets. You’ll want to review the upload and storage limits. Some repositories offer limited free storage before a fee is charged. Be sure to look over each data repository’s features and compare them with comparable services. For instance, does your data repository use common licensing agreements (Creative Commons) that will help others understand what they can and cannot do with your data? A “general” data repository is subject independent and will have data from many fields. General data repositories are often well-known solutions with large user communities. General repositories are great places to store all your data because they tend to have robust features (like simple GitHub integration), strong institutional backing, and are indexed by search engines. The downside of general repositories is that because there is a lot of everything, users might have more difficulty finding your work. Harvard Dataverse: Harvard’s Dataverse is both a platform for institutions and a data repository. 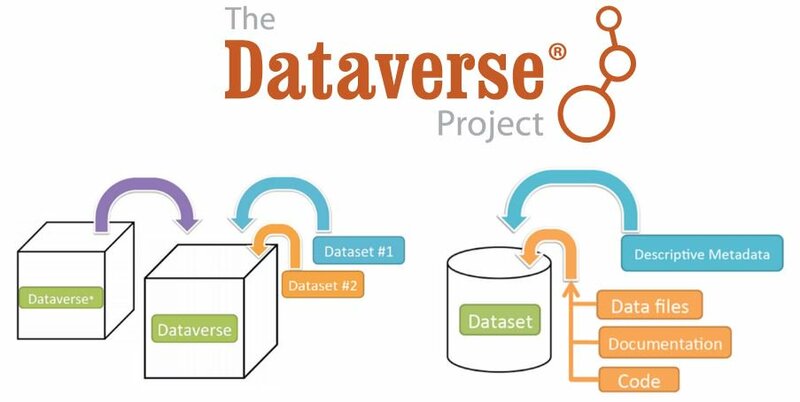 Backed and developed by Harvard’s IQSS, Libraries, and Information Technology, Dataverse has 22 installations with over 48,000 datasets, and 2 million downloads. UC Dash is an open-source, self-service toolkit for managing, openly publishing, and effectively describing data for access and reuse. Dash features geolocation metadata, ORCID, DOI, and FundRef identifiers, and generates a citation for all of your datasets. Additionally, Dash allows you to set a timed-release of data while undergoing peer-review. Zenodo accepts 50GB per dataset and integrates nicely with GitHub. While Zenodo doens’t seem to detail its download numbers like other services, it is partnered with CERN, which stores more than 100PB (petabytes) of data. Open Science Framework integrates with major storage workflows like Github, Google Drive, Box, etc. Many subject-specific data repositories exist today. Unlike a general data repository, discipline-based repositories can be very specific and well-known within a particular field. This can be both a good thing and a bad thing. Re3data.org: The Registry of Resarch Data Repositories is a service provided by DataCite (a global non-profit that provides DOIs - Digial Object Identifiers). With over 1,500 data repositories listed, re3data.org is likely to have a repository in your discipline. OpenDOAR: OpenDOAR (Directory of Open Access Repositories) is an curated and authorative list of academic open access repositories. Not only do staff of OpenDOAR visit each repository listed but they also review each repository for quality (a pretty big task considering they have 2,600 listings). Included in OpenDOAR are datasets, articles, books, and software. Simmons College hosts the Open Access Directory’s list of Data Repositories. The Open Access Directory is maintained by the Open Access community and an editorial board. It includes repositories ranging from archaeology to physics. Demo Dataverse for fooling around with. A play example of using the dataverse package in R to search for data and download it. Using the Comparative Overview of Features document as a template, think about your own research and the kind of repository (general vs. specific) that makes the most sense for your archival needs.